The sci-fi film After Earth marks the return, after 2010's awful The Last Airbender, of director M. Night Shyamalan stepping back behind the camera. It also serves as the second time, after The Pursuit of Happyness, father and son behemoths Will and Jaden Smith have appeared on film as, you guessed it, father and son. Naturally, After Earth needs much more than the talents involved to make it a true winner, but neither the former Fresh Prince, his heir apparent, nor the man behind The Sixth Sense and Unbreakable can keep After Earth from being a slight, bland adventure drenching with hammy sentiment. This film could have hit the big screen 10 years ago and audiences still would have hoped for more. Read on! Set 1,000 years after the inhabitants of Earth have left it for a more suitable planet (ie. one we haven't completely ravaged with our destructive, human ways) the film focuses on General Cypher Raige (Will Smith) and his, Kitai (Jaden Smith). Cypher is a great warrior, able to totally shut out fear, which is handy when dispatching of vicious alien creatures who can literally sense the emotion. This also causes distance between father and son, and though Kitai wishes to be a strong soldier like his father, he lacks the focus his father carries in droves. Sounds like the perfect formula for a father/son bonding road trip…or space trip. However, when their ship collides with an asteroid field, Cypher and Kitai find their ship crash landed on the planet their people abandoned so many centuries before. Earth has changed. The planet freezes over at night. The animals have evolved and become more dangerous than ever. Cypher is left immobilized after the crash, and his son must trek across the planet's dangerous terrain to recover a homing beacon that will save their lives. Oh, there's also one of those fear-sensing aliens on the loose just to add to the suspense. At least, that's what the alien as well as the dangerous creatures now inhabiting Earth are meant to do for After Earth. Unfortunately, suspense never comes into play here, the story settling comfortably in its Point A-to-Point B structure and never bothering to switch it up or provide any surprises. It's shocking to see a film like After Earth from the man who was best known for his twists and turns. Predictable and without even a modicum of spice, the film plays out blandly before your eyes, hoping the sight of Jaden Smith running through the woods can provide enough intensity to keep the audience invested. It can't. Neither can the worlds Shyamalan and c0-screenwriter Gary Whitta (The elder Smith is given a story by credit) have created here. We only get snippets of information about Nova Prime, the planet where humans now reside, beyond its militaristic attitude and the strange accent people have picked up. The sets feel like sets. The CG buildings come across as precisely what they are. Not even the future Earth is realized to the best of its potential. There's only a brief description of the environment and life on the planet, and all we're shown is a 60-mile stretch of woods. What promises to be a sci-fi epic only achieves the slimmest, most surface-level adventure imaginable. That sentiment, hammy as it is, is where After Earth actually wins a bit of favor, believe it or not. Shyamalan has always been a director who knows how to strike the right chord with mood, score (once again, James Newton Howard turning up the strings) and a general strong suit when it comes to letting his camera breathe. He holds on Will Smith for long takes while the actor delivers dialogue, sometimes full speeches, and the emotion they're aiming for always seems to come across, sometimes almost effortlessly. Sure, Shayamalan knows when to hold on his actors and when to cut away, but let's hand it to Smith for knowing precisely how to drop in that dialogue and how to punch out those speeches. Smith's Cypher Raige is a man who, for 99% of the time, is completely without fear. Smith nails that side of the character, not even batting an eye or pursing a lip in the instance when they're ship is struck by destructive asteroids. But it's that 1%, only a few times in After Earth, when Cypher has fear and Smith seems in physical pain that he's letting it show even a little bit. 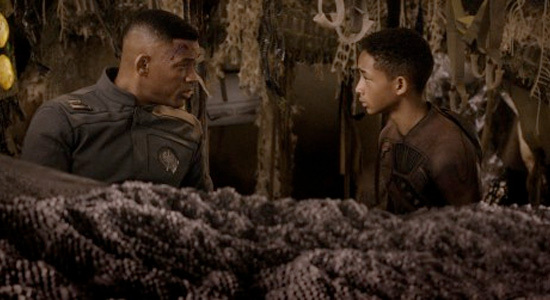 It's almost worth seeing After Earth for Smith's performance. But it's only half of a two-man cast, each actor having to react to a character they're nowhere near. Jaden and Will Smith come across as comfortable together as, well, father and son. It's when Jaden Smith's Kitai is out on his perilous adventure that the young actor really has to show us something. His solitary performance ends up playing right along with After Earth's general demeanor, fine but, unfortunately, wanting. The waste of potential is strong in this film, as if the general idea of what After Earth could have been was tinkered with and adjusted until it looked like a flat, flavorless mound. Whether the fault lies in the initial concept or one of the various stages of completion is difficult to say. The only aspect of After Earth that is undeniably worth merit is the elder Smith's performance. Everything else is best left abandoned for a far better world than this. Maybe in 1000 years, After Earth will have evolved into something with teeth. Honestly Jeremy, I feel kinda bad for you that you have to sit through these crappy movies and then even write about them.. ugh! but thanks for doing it 🙂 I trust your judgment seeing that we mostly have the same tastes, so if I'm unsure I tend to just take your word for it. I'm sure you've spared me a lot of dumpy movies! Dish Nation showed some clips last night, the written was really bad in the clips and they said "Skip It" and I will. It'll be a smash and recoup the budget. Remember,there are people living outside the USA and they love Will smith and his family. On the strength of that only,it will be a success. Besides,it's more about the message that pervades throughout aka facing the unknown. ^ M Night pushing his own movies through internet threads: Confirmed. Hey M Night where the unbreakable magic, WHAT HAPPENED? I assume the Big success poster is all about $cientology. I live in Asia. I do not want to see this garbage. M. Night Shyamalan is that you? i cant care less about will smith and even less about his son.... im from Argentina..
And defeating animals that have evolved to only kill humans...while...there...were...no...humans...around. But they still evolved to only kill humans. Funny how the M. Night Shyamalan name was used as a selling point for ppl to see his movies in the past and NOW (or in this case at least) it wasn't even marketed in the commercials. To be honest, I'm ashamed Will Smith would even take a role with this guy. Will picked him. Its Will's story then he hired Gary Whitta and M Night to write and direct. first, M. Night "needs to stop twisting movies" now it's "too bland" make up your mind, critics... stop going into his movies with preconceived notions as well. 5 out of 10 is the worst score: neither all good or all bad. Just bland. I was going to see it until this review. I check Rotten Tomatoes just in case Jeremy's review was the exception and not the norm, and it's the norm. 13% on RT. Yuck. I wouldn't watch this for free. Cmon ppl I don't think it's not bad, This is not a M Knight film, he was just chosen to direct it that's all. It's Smith story. But what I can't stand is what everyone is feeling that he's forcing his kids to us. Did anyone see Jaden on the David Lettterman show? you tube it or google it..the kid is total freak job. He just seems so entitled and arrogant in a weird kid way, seriously try to see it and you'll see what I mean. Saw the movie tonight, and couldn't agree more with the rating you gave it. As cool as it was seeing evolved wildlife, there wasn't much as going on with the story. In truth, there was really no need to make the movie, no purpose, no feelings when the movie ended, nothing to remember it by with a message at the end like all movies seem to have. I don't understand with M. Night...he was so talented with 6th Sense and Signs (and I did like The Village)...I just don't understand what happened to his subtle suspense movies to creating crap movies now. Anyways, movie hoped and so both it and "Now You See Me"; if anyone has to choose between the two...go see NYSM first, its a pretty good movie, chalk full of surprises and twists. It's NOT THAT BAD!! Last Airbender? Terrible. Happening? terrible After Earth? Better then those 2 that's saying something. I gave it the benefit of the doubt but unfortunately I felt like I wasted my money. I watched this after Star Trek which made the sad CG effects even more distinct. I have to say that the art design team was a heavy disappointment too. It suffered the same awkward vision that Aeon Flux did. The costumes and sets from ST and Oblivion felt futuristic whereas this was trying too hard (except the 3D computer graphics). The scenes with green screen were carelessly obvious. They showed too much in the trailers and the teen's adolescent voice was painful to listen to. Wish M. Knight would go back to what he does best...scaring people. I was mostly put of by the kids voice. The story was a bit Twighlight Zonish or maybe Starship Troopers? It really wasn't that bad. It wasn't great, but it wasn't the worst movie I've ever sat through. After the sixth sense, it only went downhill with Shyamalan"s movies. I could still dig unbreakable, but all the rest wasn't worth the money, so I saw them on TV, says enough doesn't it.